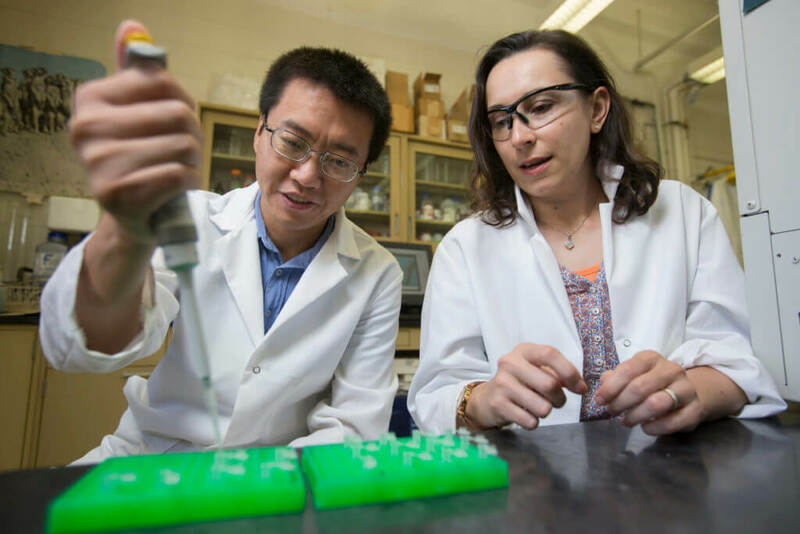 DEKALB, Ill. – The National Science Foundation has awarded a prestigious Faculty Early Career Development Program (CAREER) grant of $911,000 over five years to NIU biological sciences professor Yanbin Yin. The funding will support Yin’s bioinformatics research, which seeks to gain a better understanding of an important class of enzymes in plants and microbes that results in the production and breakdown of carbohydrates. 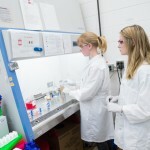 Professor Yanbin Yin and postdoctoral research associate Elisabeth Fitzek prepare algal DNA samples. The research could contribute to the making of lower-cost biofuels, help prevent crop loss due to microbial pathogens and illuminate how algae evolved to land plants. It could also benefit human health research. Dietary carbohydrates feed trillions of bacteria within the human gut and have a profound impact on the population dynamics of these bacteria. The CAREER grant is NSF’s highest honor in support of junior faculty who exemplify the role of teacher-scholars through outstanding research, excellent education and the integration of education and research. Yin specializes in bioinformatics, a blending of biology and computer science for analysis of highly complex biological data. 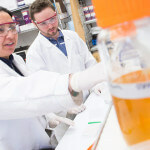 He specifically seeks to shed light on enzymes known as carbohydrate active enzymes, or CAZymes. This large class of enzymes is responsible for the synthesis, degradation, modification and recognition of all carbohydrates. Complex carbohydrates found in plant cell walls are the most abundant, and renewable, organic material on Earth. Microbes use CAZymes to break down plant carbohydrates into simple sugars, which can be further converted into biofuels and other biomaterials. 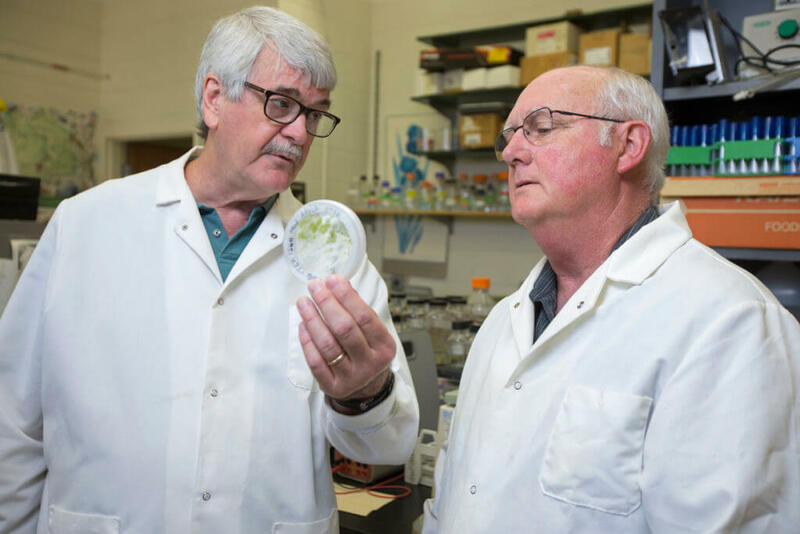 Professors Scott Grayburn and Jon Miller examine a culture of filamentous algae. Yin’s research team will develop computer tools to better identify CAZymes from newly sequenced microbial genomes, sequence the genome of a green alga (Zygnma circumcarinatum) and peer into the evolutionary processes within early plants. Yin will collaborate with Scott Grayburn, director of biology’s Molecular Core Lab, on the algal genome sequencing work. At least two graduate and two undergraduate students at NIU will be involved in each year of the research, with an emphasis on recruitment of under-represented minority students. A portion of the NSF funding will be used to hire one postdoctoral associate for the first two years of Yin’s study. Additionally, Yin is collaborating with biology professor Jon Miller to recruit pre-service high school teachers from NIU’s educator licensure program. The goal is to provide those students with practical, hands-on genomics and bioinformatics skills that they can bring to their future classrooms. In addition to the NSF grant, Yin recently received a $373,000 R15 grant over three years from the National Institutes of Health. That award funds development of new computational tools for the analysis of the role of microbial orphan genes in the development of infectious diseases.